The cruise of a lifetime aboard the award-winning m/s Paul Gauguin is closer than you think! including air from Los Angeles! Share needed! Join Cathy and her Mom on this once in a lifetime cruise in the beautiful Tahiti islands! Enjoy two full days in the quintessential Pacific paradise of Bora Bora including an exclusive beach on a motu off the coast. Marvel at towering Mount Otemanu and snorkel in sapphire lagoons. We will visit Fakarava, a UNESCO-classified Nature Reserve where experienced divers can descend up to 130 feet to visit a world inhabited by gray sharks, schools of colorful fish, and untouched coral. 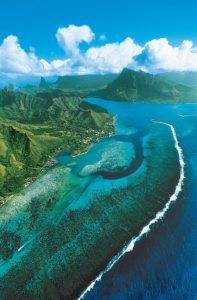 We will visit Huahine, the "Garden Island," with lush rain forests, dramatic landscapes, and idyllic lagoons. 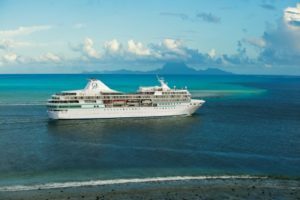 Designed specifically to glide through the shallow seas of the South Pacific, The Gauguin is the flagship of Paul Gauguin Cruises and a small-ship cruiser’s dream. She delivers travelers to intimate ports inaccessible to larger cruise ships, all the while providing an onboard experience that is nothing short of luxurious. Guests aboard our luxury cruises enjoy spacious suites and staterooms(more than 70% with private balconies), an onboard watersports marina, three dining venues, an extensive spa, and five-star service. 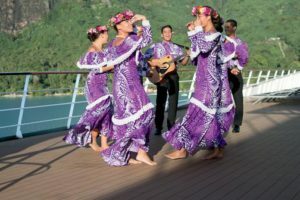 Life onboard also reflects the beauty and rich cultural heritage of the islands she calls upon, with a warm, friendly feel, informal setting, and even a beloved troupe of Gauguines and Gauguins—local Tahitians who serve as cruise staff, entertainers, and storytellers.